Thomas George may have been living here as early as 1st January 1746 and was recorded again on 10th May 1762. In 1786 the property was Bridell farmhouse, occupied by Mary George, widow. In 1787-1803 Thomas George was the owner & occupier. At a service held in Blaenwaun Baptist Chapel, St. Dogmaels, on May 18th 1815, the wife of Thomas George died in the gallery. In 1823 Thomas George of Bridell Farm wrote his will, leaving an annuity of £4.5s. to his niece of the same address, Charlotte George. He left an annuity of 1s. to his children, John George, Daniel George and Elizabeth George. His lordship of Cefn Chirchog he left to his relation, Thomas George of Cardigan, solicitor. In 1824 Elizabeth Lloyd, widow of Thomas Lloyd of Coedmore, Llechryd, lived here. In 1828 Thomas George died. In 1829-30 James Bowen was the owner/occupier. By 1831 the property had been upgraded to “Plas-y-bridell”. From about 1832-44 George Hankin & Charlotte Francis Hankin lived here. An 1830’s illustration refers to it as the home of G. Hankin Esq. and shows a square, two storey house, with a central stone stack and trellised garden frontage. On 19th February 1832 Anne Susan Hankin, daughter of George & Charlotte Hankin, was baptised at Bridell Church. Other children born to the same couple were also baptised at Bridell Church – Powell Hankin on 22nd December 1833; Julia Hankin on 24th May 1835; Charles Loveson James Hankin on 9th July 1837; James Gough Hankin on 16th December 1838; and Louisa Emily Hankin on 25th February 1844. On 15th June 1833 Anne Commelin of Plasybridell, widow of Charles Russell Crommeline of the Bengal Civil Service, died aged 57. On 25th September 1837 Charles Loveseon Hankin of Plasybridell died aged 3 months & 3 weeks. On 15th June 1841 James Gough Hankin of Plasybridell died aged 2 years and 6 months. In 1843 Sophia Lloyd (Coedmore House, St. Mary St., Cardigan) lived here, and leased Lloyd’s Wharf, Cardigan from her brother, Oliver Lloyd (Coedmore House, Cardigan). In 1850-52 James Bowen of Plasybridell was the Coroner for the County of Pembrokeshire. In 1851 the following persons lived here: James Bowen, 48; Elizabeth Bowen, 51; and four servants – Ann Picton, 21; Sarah Thomas, 26; Margaret Thomas, 57; and Joshua Thomas, 22, groom. 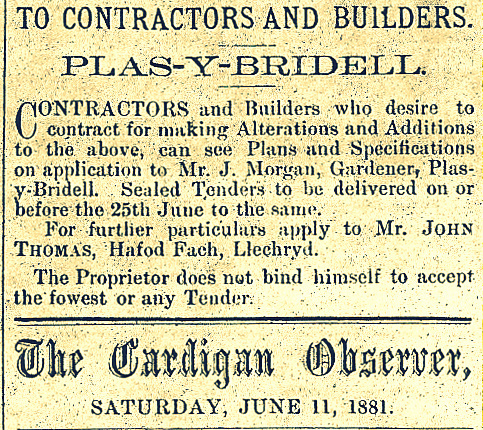 On 20th March 1855 Joshua Thomas, 27, a servant here, married Margaret Davies of Bridge End, Cardigan. On 19th October 1855 Samuel Henry Duntze of Plasybridell was buried at Bridell Church, having died aged 56 on 16th October. On 7th August 1856 reference was made to James Bowen, formerly of Plasybridell, but then residing at No. 3 Victoria Place, Hotwells. On 16th March 1860 Georgina Lucretia Agnes Duntze of Plasybridell was buried at Bridell Church, having died aged 22 on 13th March. In 1861 the followingpersons lived here: Frances Armitage, 61, widow; Mary Armitage, 30, her daughter; Jane Armitage, 29, daughter; Theopila Palsin (? ), 70, her sister; and 4 servants – Miss Nicholas, 30; Mary Daniels, 22; Anne Thomas, 15; and Anne, 30. 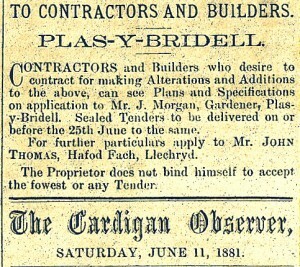 On 8th September 1865 Plasybridell with 6 bedrooms was advertised to let, then occupied by Philip Jones Rees. In 1868 the estate, including Ty Gwyn, belonged to Mr. J. W. Bowen. In 1869-80 Milham Hartley lived here. On 6th January 1869 Henry Hartley, son of Milham & Agnes Hartley of Plasybridell, was baptised at Cilgerran Church. In 1871 the property was occupied by: Milham Hartley, 42; Agnes Hartley, 42, his wife; Henry Hartley, 7, their son; Mary Cowt, 20, step-daughter; Elizabeth Davies, 40, nurse; Esther John, 31, cook; and Rachel Griffiths, 32, house maid. On 21st February 1871 Rachel Griffiths, servant, married mariner Thomas Griffiths of the Mwldan, Cardigan. In 1873 James W. Bowen, Q. C., who had a 1,416-acre estate, had the house repaired. In 1871-74 Mrs. Hartley still lived here. On 5th November 1873 Margaret Hartley, daughter of Milham & Agnes Hartley of Plasybridell, was baptised at Bridell Church. On 5th February 1874 John G. Vaughan of London married Agnes Cowan (?) of Plasybridell. On 19th February 1879 Henry Thomas Gwyn Vaughan of Huntingdon married Mary Cowan(?) of Plasybridell. On 23rd January 1880 M. Hartley and T. Lloyd were resident. On 20th April 1881 there was a sale of livestock, implements and household furniture from the property. On 5th June 1881 tenders were sought for alterations and additions to the building, perhaps a complete rebuild. In 1884 Thomas Lloyd lived here. On 2nd January 1885 Tom Bowen lived here. There were plans for building new stables at that time. By 28th April 1885 J. W. Bowen Esq., Q. C., was a Guardian of the Poor. Reference was made on 11th August 1886 to the Will of James William Bowen of Plasybridell, deceased. Miss Bowen was resident at that time. According to the ‘Cambrian Journal’ James William Bowen, Q. C., of Plasybridell, died on 8th February 1888 aged 68. In 1887 Thomas Lloyd, nephew of Thomas Edward Lloyd of Coedmore, Llechryd, moved here. In 1888-92 Thomas Edward Bowen occupied the house. In 1891 the following persons lived here: Jane E. Bowen, 63, independent, widow; Thomas Edward Bowen, 32, stepson; Mary E. Bowen, 31, step-daughter; Margaret Bosville, 20, niece; Helina Bosville, 20, niece; Nellie Bosville, great niece; Rosina Patterson, 24, nurse; Anne Birch, 45, ladies’ maid; Eliza Hands, 30, housemaid; Eleanor Davies, 25, parlour maid; Ellen Griffiths, 23, maid; and Mary Prothero, 26, kitchen-maid. On 7th May 1892 servant Mary Prothero married David Griffiths of Cilgerran. In 1896-98 Miss Bowen lived here. On 12th October 1898 Miss Bowen, only daughter of the late J. W. Bowen of Plasybridell, married Rev. James Beaucroft. In 1899 Mrs. Bowen occupied the property. In March and April 1899 there were clear-out sales here. Thomas Lloyd, who had lived here since 1887, allegedly moved out in 1903 (or died?). In 1901 the following persons lived here: Emily E. Roch, 45, widow living on own means (b. Llanboidy); Walter Francis Roch, 21, her son, articled clerk & solicitor (b. Llanboidy); Mary Roch, 22, daughter (b. Llangwm, Pembrokeshire); Mary E. Kirkham, 27, cook (b. Plymouth); Anne Griffiths, 29, housemaid (b. St. Ishmaels, Pembrokeshire); Elizabeth J. John, 30, parlour maid (b. Laugharne); and Thomas G. Moore, 14, useful boy (b. Milford Haven). The household was English-speaking. In 1904 Walter Francis Roch (20/01/1880-03/03/1965) and Mrs. Emily Catherine Roch, his wife, took up residence here. Walter was the second son of William Francis Roch of Butter Hill, Pembrokeshire (d. 1889). In 1904-19 Mr. W. F. Roch & his mother, Mrs. Roch, lived here. On 19th November 1907 Jullian W. M. Vaughan of Plas Llangoedmor married Mary Catherine Roch, 28, daughter of William Francis Roch, of Plasybridell. In 1908 Walter Francis Roch became the Liberal M. P. for Pembrokeshire until 1918. In 1909 William Prothero Roch lived here. On 20th April 1911 Walter Francis Roch, M. P., of Plasybridell, married the Honourable Miss Fflorens Mary Ursula Herbert of Llanarth Court. On 6th January 1912 Wilma Julia Blanche, daughter of Julian Wilmot Morris Vaughan & Mary Catherine Vaughan of Plasybridell, was baptised at Bridell Church. In 1913 Walter Francis Roch became a barrister at Middle Temple. In 1916 he was appointed to the Dardanelles Commission. In July 1916 he was called up for service. On 11th March 1918 Lieutenant William Prothero Roch, son of Mrs. Roch of Plasybridell was believed to have died in Palestine. On 25th May 1918 Captain G. P. Roch of Whitland, another son of Mrs. Roch, died. In September 1918 Mrs. Roch discovered that Lieutenant W. P. Roch was still alive – a prisoner of war. In August 1919 Mrs. Roch sold Plasybridell, with 24 acres, to Mrs. Jones of Roby Villa, Cardigan. In 1919-21 Mrs. Roch and Mr. Wilmott Vaughan lived here. In April 1920 Mrs. Roch announced that she was leaving Bridell after 20 years. In 1921 Captain Jones was living at Plasybridell, but was only using four bedrooms and treating the building as a farmhouse. He left in September 1921 and held a clearance sale here on 22nd September 1921. In 1926 Lewis Pugh Evans Pugh was the occupier. In 1929 Lewis Griffiths Pugh lived here. In October 1929 he sold Plasybridell for use as a Roman Catholic school. The farm, outbuildings and parts of the estate were sold off in December 1929. On 16th July 1930 the property was blessed and enclosed by the Cardinal and then opened as a Carmelite Monastery. On 5th October 1932 the parish priest – Rev. Father Joseph Higgins, died. On 9th June 1934 the outbuildings and land were sold by auction. On 12th May 1936 a memorial to Father Joseph Higgins, chaplain of the monastery, was unveiled at Bridell Church. In April 1937 the farm was advertised for sale. In 1950-56 Mr. G. Thomas lived at Plasybridell Farm. On 30th May 1975 the forthcoming closure of the Carmelite monastery was announced, and it closed before the end of that year. On 17th October 1975 the property was advertised for sale. It comprised: Ground Floor: porch; large hall; Drawing Room; 2 Sitting Rooms; Dining Room; Library; Kitchen with Scullery and Pantry; Parlour; Living Room; Kitchen; and toilet. First Floor: 12 Bedrooms; 2 Bathrooms; toilet. Second Floor: 6 Bedrooms; Chapel with Sacristy; Bathroom; Toilet. Basement with 3 Cellars. On 3rd March 1988 the house opened as a nursing home for the elderly. In June 2006 Cllr. Wynne Evans, Mayor of Cardigan, opened a sensory garden here. Large, rambling house of c1873, altered c1881. Ashlar built with sandstone dressings to mullioned windows, slate roofs with red brick stacks, 3 storey main range of 6 irregular bays. Two bays to left have bipartite square-headed windows to ground and first floor. Taller similar lights to stone eaves-breaking dormer gables, with decorative bargeboards and slate roofs. Third bay has taller roof line and taller ground floor and first floor windows in similar style, smaller, flatter window to similar dormer gable. Bay four is 2-storey gable fronted projection with pointed headed arched entrance with narrow single lights to each side and 2-light above. Left end wall has ground floor 2-light. Decorative bargeboard and pitched slate roof. Bays 5 and 6 possibly later, with a higher roof line, hipped to right end with weathervane. Both bays have plate glass sashes with sandstone lintels over, no dressings, and attic lights with heads to slightly raised eaves. Modern extension in stucco render to right. Left gable shows the house to have 2 parallel ranges with a roof valley between. Single storey building to left with pitched slate roof and red brick window dressings. Thanks Stephanie, fascinating to hear more about the Hankin family!